Videogame titles are often hit or miss. In my time with games, very rarely is a game's title very spot on. Now, I was rather surprised with the demo of Bootleg Systems. Its title actually tells you everything you need to know. 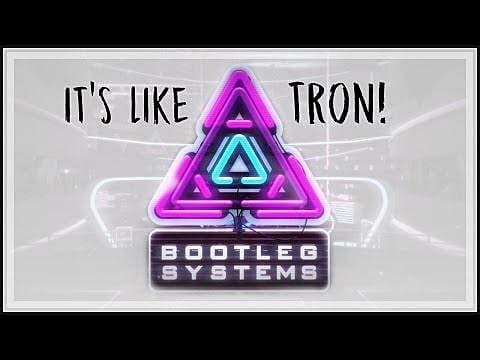 Developed by Neonable and scheduled for a 2017 release, Bootleg Systems is a First Person Shooter (FPS). It's not just any FPS however, it's cyberpunk in flavor and also a puzzle platformer as well. The back story tells of a dystopian future for mankind. Technology has advanced where we rely on AI to preserve our legacy. It's a grand task considering that we can't give birth and hold our physical forms. Some very bad people get a hold of that precious data for their own purposes -- Yes it's a trippy tale but it definitely goes hand in hand with the neon bright future. You're an agent tasked with the job to stop them. So your weapon in this fight is a clone gun. Yes, a clone gun that can copy nearly anything and everything. Now to go back to my earlier point about the name, we'll look at the word bootleg. Bootleg: make, distribute, or sell illegally. In this case, you can create, distribute and use copies of items to achieve your goal. So the title cleverly tells us everything we need to know. With whatever item you've scanned, you can use it as a weapon. For example, you can scan a dumbbell and hurl it at enemy machines to dispose of them. In the demo, I also found myself using furniture to vault over obstacles as well. In a firefight, items can be used as partial cover if necessary. Although it's not quite finished, the demo is very promising. Visually, the world appears to be very Tron-like. The music featured is of the same nature as well; thumping, ambient, and of course electronica in nature. In such a futuristic world, it's rather novel to be using human imagination as the best weapon. I have few worries about the game; the most notable is the lack of full pad support but that's a minor concern really. I mean, you can fire rolls of toilet paper. The purpose that ultimately serves is unknown but you can still do it and options are important for games. Fans of platformers, first person shooters, puzzles, and retro influenced titles can look forward to Bootleg Systems for PC in 2017.